← Everything is OK, or Not. 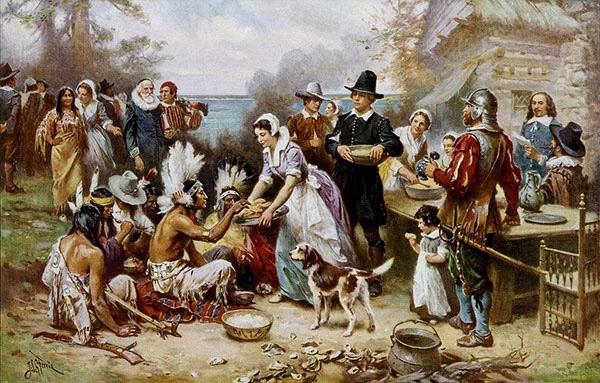 The origin of Thanksgiving Day has been attributed to a harvest feast held by the Plymouth Colony. In 1621, Governor William Bradford of the Plymouth Colony proclaimed a day of “thanksgiving” and prayer to celebrate the Pilgrims’ first harvest in America the year after their arrival on the merchant ship Mayflower. The picture you usually see of a few Native American men joining the Pilgrims at the feast is a bit inaccurate, however. From original settler Edward Winslow in a letter to a friend in 1621, we know that some 90 men accompanied the Wampanoag Chief, Massasoit, to visit at Plymouth for three days of fish, fowl, and venison. But of the roughly 100 English settlers who had spent their first year on the Massachusetts coast, about half had died by this time. This would have left about half the 52 survivors as English men. So the Native men outnumbered the Pilgrim men by over three to one! We would be most THANKFUL if you would allow us to serve your ministry all year long. Click here for details! Each succeeding president made similar proclamations until Franklin D. Roosevelt, in 1939 appointed the third Thursday of November, primarily to allow a special holiday weekend for the national public holiday. This was changed two years later by both Congress and the President to the fourth Thursday of November. Now you understand that scene in the movie Holiday Inn where the confused turkey jumps between alternative Thursdays in the calendar in November.